Once the theory has been completed you can simply contact the RAID Regional Office (RRO) and an IT/Examiner may sign you off or they may require you to complete Open Circuit workshop at their discretion. For a limited period all RAID Instructors are currently qualified to teach the Try Dive program but we strongly recommend they complete the on line Try Dive Instructor Course as soon as possible. From now on all new RAID Instructor candidates successfully completing the IDP will exit with the RAID Try Dive Instructor rating just as they currently do with Deep and Nitrox. How is the experience taught? The Open Circuit Try Dive is available in TWO formats; online and offline. The online version is similar to all other RAID training and must be completed, checked and signed off on successful completion. The offline version is to cater for circumstances such as resorts where it may be a spur of the moment decision by the participant to try diving. With this option the participant simply completes the offline paper RAID Try Dive Registration Form, listens to a presentation from a RAID Try Dive Instructor using the RAID Flip Chart and is assessed by the Instructor before proceeding to the water. With both versions the water work may be done in a pool or suitable open water location. 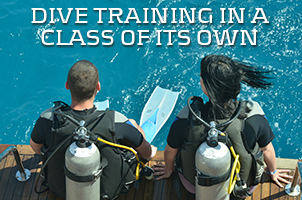 A RAID Divemaster / Level 4 diver may deliver the pool training section only - see the Instructor Guide or RGDS for more details.